The web browser on the BlackBerry Bold Touch 9900 is one of the best we have seen lately. Despite the smallish display, the browser still does an excellent job and will serve you well. It is fast, responsive, supports multi-touch zooming, text selection, text reflow, mouse cursor, etc. The only thing missing is Flash support. If you decide to use the trackpad instead of the touchscreen, you'll get a virtual mouse cursor and automatic panning and scrolling when you reach the end of the screen. Multiple tabs are supported and switching between them is pretty easy - just tap on the tabs key at the top right corner. Page rendering is near perfect, displaying almost every page like on a desktop browser. Text reflow works like a charm, responding promptly to your double taps. Other than the missing Flash support, the handset provides probably one of the best user experience in browsing the web despite its smallish display. True to its business ethic, the Bold Touch 9900 has superb time-management capabilities. Its organizer includes a decent set of applications and although some of them are hardly lookers, their usability cannot be called into question. The calendar has monthly, weekly and daily view modes and lets you easily set up customized events. We have to admit that some event presets would have been useful but sadly the device fails to provide them. The phone comes with the full version of Quick Office pre-installed allowing it to view all kind of documents (incl. PDF) and edit Word, Excel or Power Point files. The organizer package also includes a calculator with a built-in unit-converter, as well as a voice recorder and a Notes application. A handy To-do manager allows you to set-up and organize your upcoming tasks. The alarm application has only one alarm slot and fails to impress. It's quick to turn on but most of its settings can only be adjusted from the settings menu. There you can change the alarm tone, snooze time and the volume as well as the vibration intensity. Given the single slot limitation though, getting an alternative alarm clock app from the BlackBerry App World seems like the right thing to do. The BlackBerry Bold Touch 9900 comes with a stopwatch and a timer. Both are accessed from the clock application and have the standard functionality. The clock also offers a bedside mode that turns off the status LED (unless you set it otherwise) and displays a large clock on the screen. There are also a Password Keeper app, Voice Recorder, Memos and Tasks app to store your passwords, voice memos, text memos and tasks. 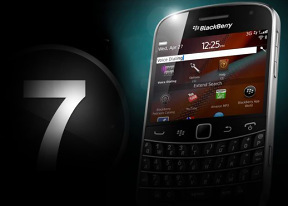 Finally, the BlackBerry Bold Touch 9900 comes with Facebook and Twitter applications. You also get the native Social Feeds app that gathers all of your Facebook and Twitter updates in one place. As one would expect nowadays, the BlackBerry Bold Touch 9900 is equipped with a built-in GPS receiver and comes with A-GPS support. For navigation you get BlackBerry Maps preinstalled. Unfortunately it is yet another application that only works with a BlackBerry internet plan activated. And the only navigation option you get is directions.